Yesterday, I blogged on recession-friendly deals companies are offering. But thereâ€™s more to the wave of â€œrecession specialsâ€ that have many companies loosening their grips. With layoffs reaching historic highs, 8.1% in February, a number of companies responded to the uncertain times with â€œJust in Caseâ€ offers. Yesterday, I blogged on recession-friendly deals companies are offering. But there’s more to the wave of “recession specialsâ€ that have many companies loosening their grips. With unemployment reaching historic highs, 8.1% in February, a number of companies responded to the uncertain times with “Just in Caseâ€ offers. The program started Feb. 17 and covers any flights booked between Feb. 1 and June 1. 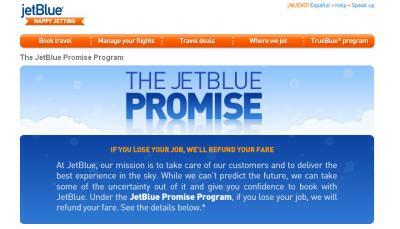 Here’s how the refunds work: JetBlue must be notified of any job loss at least 14 days prior to the flight. Customers can visit Jet Blue’s Promise program Website for the necessary documents they’ll need to mail and fax to the company. On Tuesday, JetBlue announced it will expand the offer to the Getaway program, allowing refunds on entire travel packages instead of only airfare. Auto maker Hyundai is hoping to get you into the showroom with its Hyundai Assurance Plus program. It will make three payments on vehicles purchased between Feb. 23 and March 30, in the case of any “life altering circumstances,â€ including involuntary unemployment, physical disability, and self-employed personal bankruptcy.Â The Plus program is an extension of the company’s initial Assurance program which allowed customers who purchased or leased a vehicle to return the car, given a job loss. If you cannot make payments after those three months, you can bring the car back with no risk. Here’s the catch: You have to have already made two consecutive payments and be current on your account. Calling all St. John’s University alumni! The New York school is offering half off the cost of graduate school tuition — a $15,000 to $25,000 savings — to any alumni who lost their job in the last six months, reports NY1 News. The Alumni Assistance Program also gives students access to the school’s career center where they can obtain professional advice.